Priyanka's Scrapbook: Mozilla Summit 2013....through my glasses! Mozilla Summit 2013....through my glasses! This one is gonna be long as I have too much to write this time. Mozilla Summit 2013 was my first International Mozilla event. The summit venue for me was Santa Clara, California. It was still 2nd of October 2013 when I did meet my fellow Mozillians at Mumbai International Airport. Though we were together at the airport, we were not traveling together. Mine was a flight to SFO via Amsterdam. After a long restless wait at the Mumbai airport, I did board the flight for Amsterdam. Well, it was a long flight indeed but somehow was not as tiring as I had thought it to be. I did get the first glance of Summit at the waiting lobby of Amsterdam airport. There were some 30+ Mozillians there....all heading to the Summit. Oh my god! Wearing a Firefox/ Mozilla T-Shirt made so much sense. 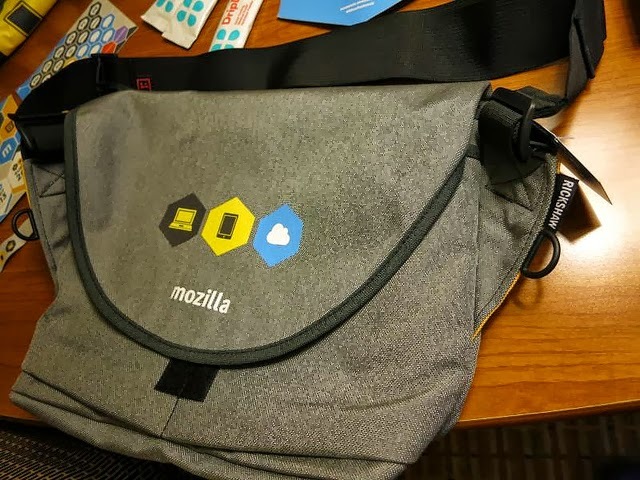 It was like several members of the Mozilla family, who didn't know each other, did recognize each other instantly by the Family mark they were in. Another long flight took us to San Francisco. At the airport, there were several volunteers who were enthusiastically waiting to receive us. A shuttle took us to the hotel. Tired we were...no doubt about that. But the moment I entered the venue, energy of several hundred Mozillians present there somehow did fill me up with energy and washed all the tiredness away. We went ahead, completed the check in process at the hotel, completed our Summit registrations, collected the cool goodies which was waiting for us and finally headed to our respective rooms. All the Mozilla India community members did meet before the Welcome reception to discuss about the next morning's country fair. The Welcome reception hall was my first realization of how huge the Mozilla family was and how little I was exposed to this family. I didn't even know 20% members present in that Hall that evening. It was so awesome an experience to have unknown Mozillians walk up to me to say 'Hello' and how those small conversations did turn into huge important discussions. The next morning began with Tristan Nitot's welcome speech. Mitchell Baker's speech about Nature of Mozilla was really encouraging. 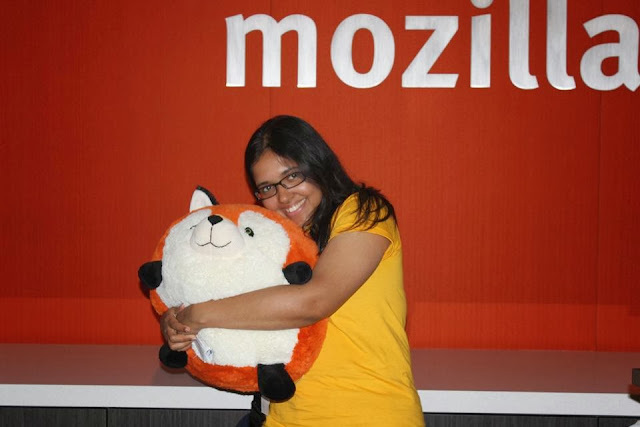 When Mitchell explains-"What makes Mozilla 'Mozilla' "....you cannot but listen to her in all attention. The World fair was so awesome that I have no words to describe it. The Indians were all in their traditional dresses and even if I sound really biased, I will have to say that the Mozilla India's booth was the most attractive one. Though more than Mozilla India's booth, I did spend my time in the WoMoz booth with Michelle and Faye. More than responsibility, it was the fun I was having making those wax seals that kept me glued to this spot. The one question which I get a lot from my friends whenever I show them my Keon-" Whats the Future of Firefox OS?" This question was best answered by Sandip Kamat and Christian Heilmann during their session. 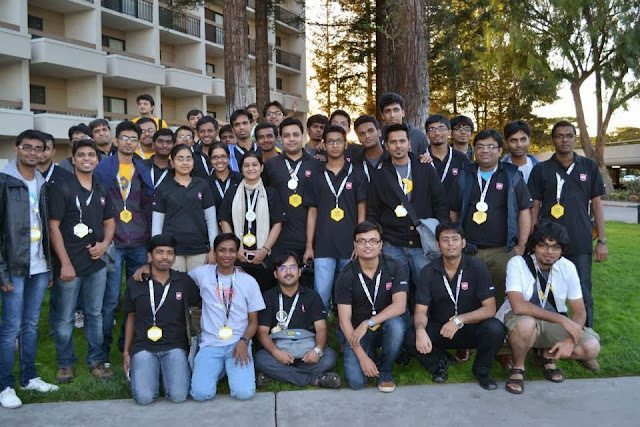 Post these sessions, we had the panel discussion session followed by the Group photo session. It was Firefox OS dinner party that night followed by awesome Karaoke performances. The morning began with Anderson, Jim and Patric's session presentation on the Health report of the web. Woooow!!!! Open web apps is completely and totally awesome. That morning's most fun part was the Innovation fair. Well, since the Innovation fair was a "Shh!! !Secret Zone" I will avoid writing much about that. Both the above stated sessions were awesomely enlightening. They were very different from each other, the discussions that took place were very different but the impact from each one was equally huge on me. That night we had a trip to the Great America amusement park. We were waiting at the lounge for the team to gather before departing to the amusement park. I remember watching a guy standing a few feet from us, a beer glass in hand. We exchanged smiles and it was then that he walked up to us. It was the usual introduction with which the conversation began. I guess it was in his 3rd sentence of the conversation, he casually said-"Do you use JSFiddle? Ya...thats one tool I have built!" We were like speechless and awestruck! We didn't know exactly how to react. I guess it was the awe stuck me that made my brains not remember his name. Well, for me, he is the 'JSFiddle God'! This morning was a bit different from the other two. This time, we were no more passive listeners. We gathered in groups and pitched in our ideas about different Mozilla products and how we could make them better. Fun it was! Sooo many brains...sooo many ideas! Ever thought about the different Community Tools - What do we currently have? What are our top needs?- Honestly I had never given it a genuine thought before attending Pierros and Soumya Deb's session. It was a brain storming session where the participants initially came out with all the problems of the present community tools followed by some probable solutions. This evening was like a dream come true evening for me. We visited the Mozilla Head quarters in Mountain View followed by the Google office. Wow! Simply simply awesome. The evening ended with the Dinner and dance party and that was the official end of the summit. This evening, I chose to spend my time in the Hacker Space instead of the dance floor. Well, I was kind of tempted to be a part of the MDN Code Sprint discussion. It was at the hacker space where I met David Walsh and Luke Crouch. I had seem them around in the past two days but it was my first MEETING with them. I have been a huge fan of David ever since the first blog of his that I had read a few years back. It was like meeting the celebrity you always admired. The moment was as if not sufficiently magical, when suddenly David came up to me and asked if I would like to help him with the front-end of MDN! Well, it was a moment when I had to literally ask my friend (Kaustav) to actually pinch me so that I could believe it was not a dream but reality! After so much of awesomeness, you never feel like returning back. But like all other great things, this also had to come to and end. After another series of long flights, I finally reached back home. P.S: I am sure I am missing out on a lot of important and interesting things here. This blog will thus undergo several updations.